Your business may be ready to go global, but are your people ready? Beyond the cultural differences and the bureaucratic challenges of operating in a new environment, local companies sometimes find their biggest stumbling blocks lie within their ranks. Are your people ready for the big, dog-eat-dog world out there? Where a few minutes may be all you have to make a difference between sealing a multi-million-dollar deal or watching it evaporate? Stephen Krempl, a veteran of four Fortune 500 companies — with YUM Brands, Motorola, Starbucks and Pepsico Restaurants — and a man well placed to appreciate what attributes will help carry a business onto the global stage notices a failing among Asian companies to carry the ball over the line when it matters. Often the leader is well positioned to build the business, but once expansion to new shores gets underway, the responsibilities should be shared with the next tier of the organisation. And this is where things could start to unravel. Based on his work over the last two decades in more than 30 countries, Krempl, who runs his own consultancy, says there’s a 95/5 principle that applies when it comes to Asian global executives creating the right impact. And a lot of it has to do with the right timing. 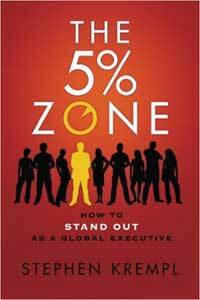 In his book on the subject, The 5% Zone, Krempl says that executives need only pick 5% of their time to be impactful — “95% of the time be who you are, but the 5% situations when you need to make an impression on someone, you have to step it up and act slightly differently”. Be it at a meeting with an important client, assisting the director at a crucial board meeting, or when representing the organisation in a different country, he says that executives have to know when to make this crucial switch. “They must be able to articulate their point of view clearly, communicate confidently in a group other than their own cultural peers, connect personally with people who come from different parts of the world, and build trust with those people, otherwise, you may be leaving business on the table. “I have seen many Asian executives being bypassed for promotion in their corporations because they cannot show behaviours that their superiors are expecting or demanding of them,” Krempl explains. Working and, more importantly, succeeding on the global stage, he says, requires more than just the technical skills and know-how but also “charisma and executive presence” and being able to connect with people from all over the world. One of the challenges of many local companies is finding the right people for the expansion phase of the business. “When you are in the C-suite, you are always trying to find executives that represent you and your organisation, do you have people who can make you look good?” he asks. While some are already naturally blessed with extraordinary effervescence in both social and business settings, Krempl says that it can also be taught to those who are behind the curve. Stephen Krempl will be sharing his views with a small group of business leaders on December 15 over lunch. As part of STORM magazine’s Keep It Going series, the talk, 5% Zone — Standing Out As A Global Executive, will allow business leaders to find out more about making an impact on the global stage.